There are many methods available for managing contacts and visiting cards. Using a card scanner and using OCR works well. But most methods fail due to lack of discipline. Here is what you can do. By the way, this can work for you as a person or the entire organization. Create a new notebook using OneNote. DO NOT make a local notebook. Store it into OneDrive or SharePoint. This way you can access it from any mobile or pc anywhere. Name it Contacts. Create sections like personal, business, friends, recruitment, customers, etc. Everyday, take photos of new visiting cards which you received. Just use any simple mobile camera. Make sure the photos are sharp. The resolution does not matter. Even 2 Megapixel camera will be fine. 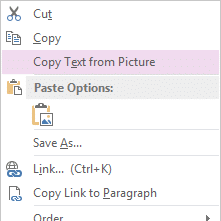 Import the images into OneNote and put them in the correct section. Now you can search for any text in that notebook. CTRL F – find , type any text. 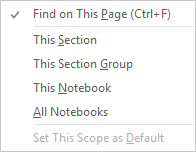 Choose the area to search – section, this notebook or multiple notebooks. OneNote can search for text automatically. The OCR (optical character recognition) software is built-in to OneNote. It also supports multiple languages. 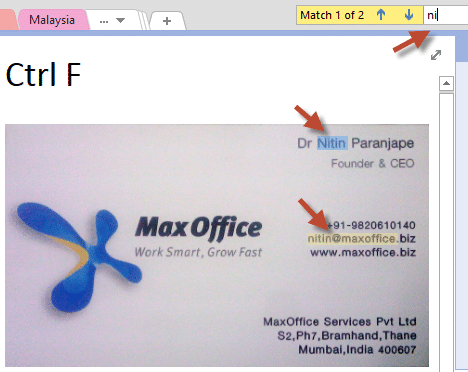 If you want the full text from a visiting card, right click and choose Copy Text from Picture and paste it into any other place. This way you can create a simple but effective contact management system! OneNote is available for free on Windows Phone, Android and iOS. Using OneNote mobile makes it even more easier. Just open the notebook – Insert Picture – take a photo of the visiting cards. That’s it. Share the OneNote notebook with your team members. Create a section for each person and ask them to add photos directly. Remember that you don’t need to take the photos separately for each visiting card. You can arrange multiple cards on a table and take a photo. This way you can add all your existing cards quickly to OneNote. Make sure you add all the past cards.